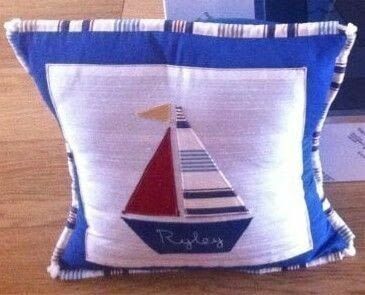 https://www.cutoutandkeep.net/projects/boat-motif-cushion-cover-2 • Posted by Tina I.
Hi This is my first project on here, my friend was making a nursery for her grandson and i offered to make her a cushion cover to add to the nursery. I cut out some triangles of material, pressed a hem on all sides, embroidered his name on the boat base shape. I then arranged them onto the white fabric, and when I was happy with it, I then pinned them in place and sewed. I made x 4 small tubes and sewed them on the four edges. I then threaded piping cord through and knotted in each corner.